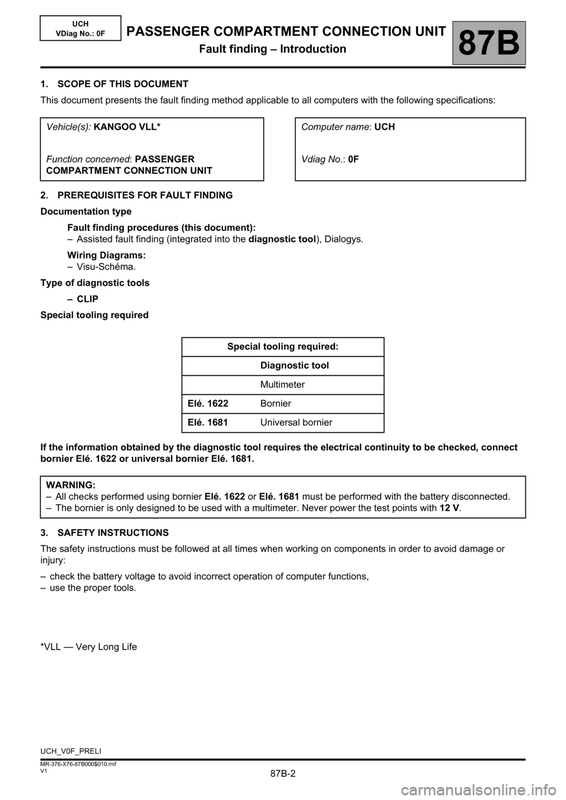 – All checks performed using bornier Elé. 1622 or Elé. 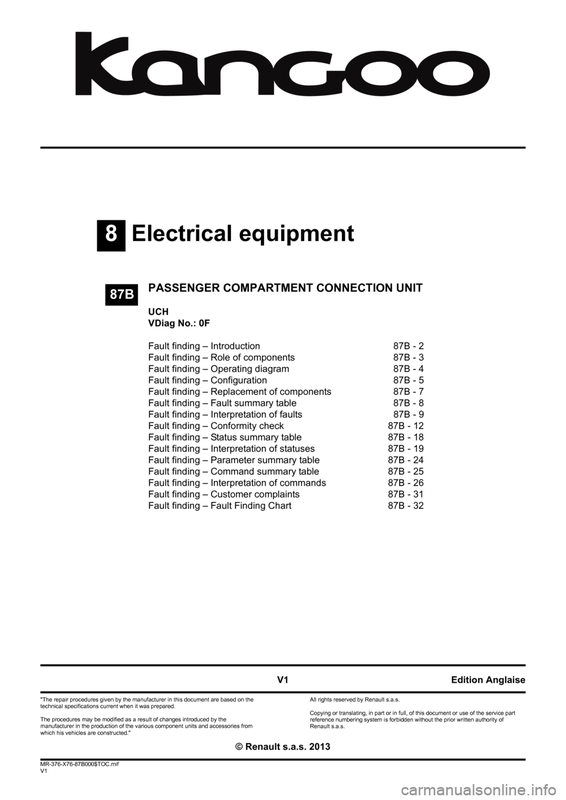 1681 must be performed with the battery disconnected. – The bornier is only designed to be used with a multimeter. Never power the test points with 12 V.
– Heating and manual air conditioning function. – In the case of a vehicle fitted with manual air conditioning, by pressing on the air conditioning button. 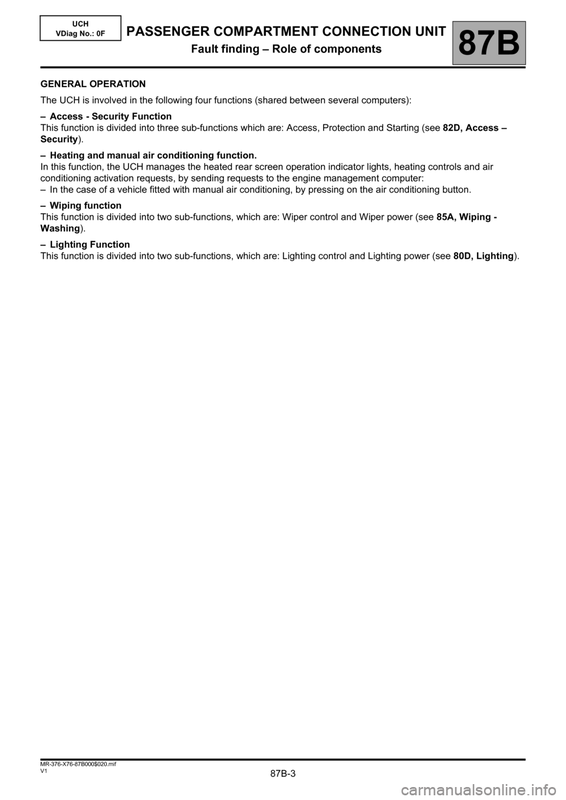 This function is divided into two sub-functions, which are: Lighting control and Lighting power (see 80D, Lighting). *CPE: Electric central door locking. ●With the ignition on, establish dialogue with the UCH computer. ●In the Repair Mode menu, go to the Configuration tab. 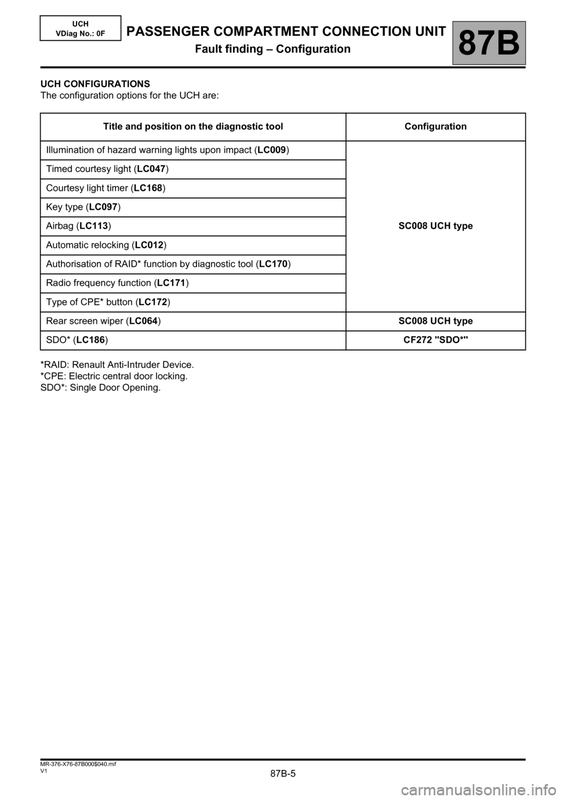 Choose the scenario: SC008 UCH type and follow the instructions on the diagnostic tool. Configuration CF272 SDO* enables the activation or deactivation of the Single Door Opening function. An initial press of the button unlocks the driver's door. Pressing the button for a second time unlocks the whole vehicle after a predefined time. Pressing the button once only unlocks the whole vehicle. Check the configuration has been correctly stored using the Configuration reading menu. – Enter the VIN, using command VP004 Enter VIN (see Programming). – Program the UCH using command SC004 Program UCH (see Interpretation of commands). – Allocate the keys using command SC015 Key allocation (see Interpretation of commands). The removal of the UCH is carried out after the left storage compartment has been removed. The UCH is clipped onto its mounting. 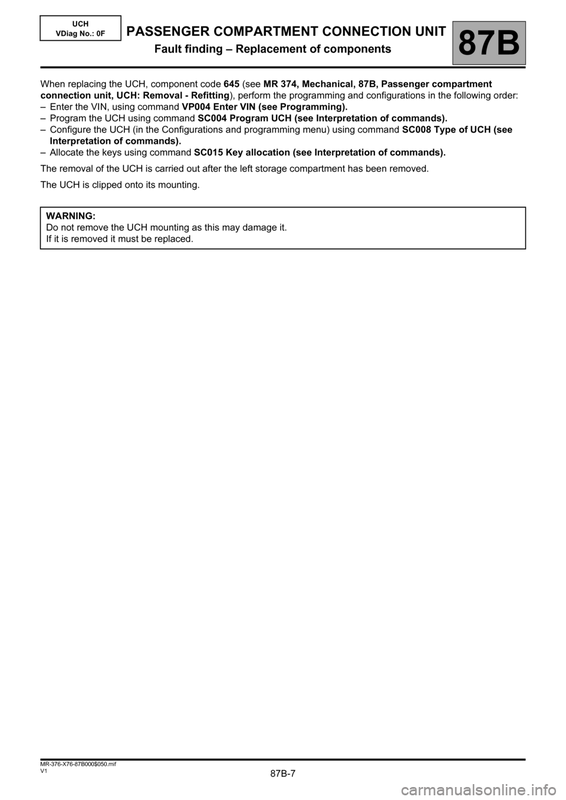 Do not remove the UCH mounting as this may damage it. If it is removed it must be replaced. Deal with any other faults. 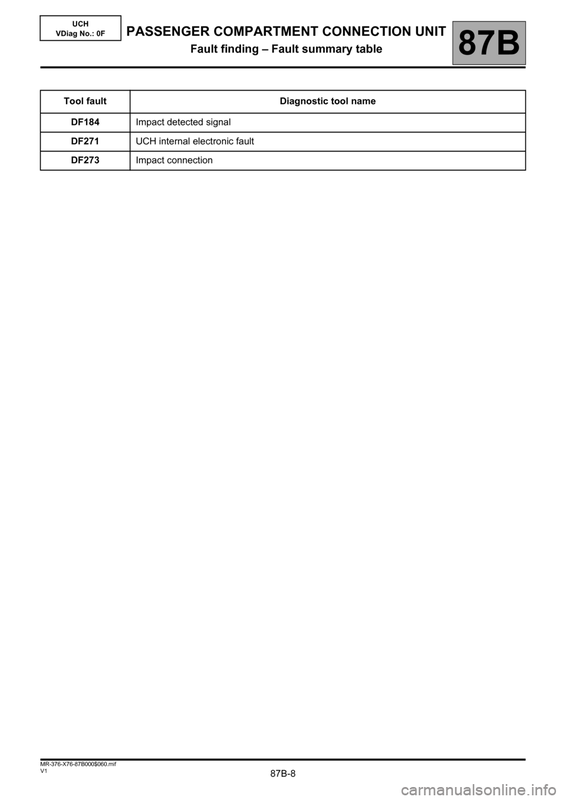 NOTESThe fault is declared stored after an impact is detected. 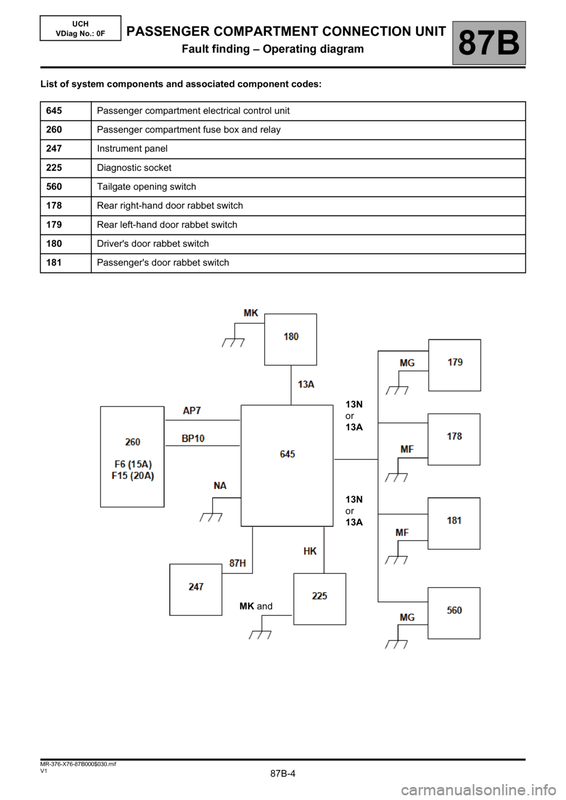 Perform fault finding on the airbag function (see 88C, Airbags and pretensioners). NOTESFault declared present when the ignition is switched off.